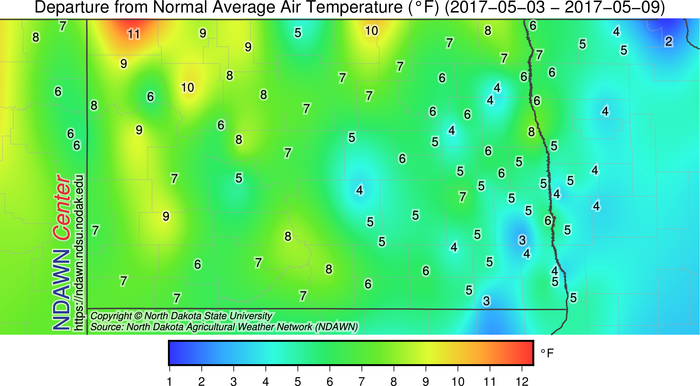 Most of the North Dakota Agricultural Weather Network (NDAWN) stations recorded temperatures between 5° to 10° above average during the past week. The highest percentage of the stations were in the positive 5° to 7° range. This was a welcomed turnaround from the very cold end of April when the last 10 days of that month were 5° to 10° below average. The warmer temperatures have pushed soil temperatures into the 50s for almost all locations with some pockets having topsoil temperatures in the lower 60s. The last week was not only mild but also mostly dry with the exception of Monday and Tuesday of this week. 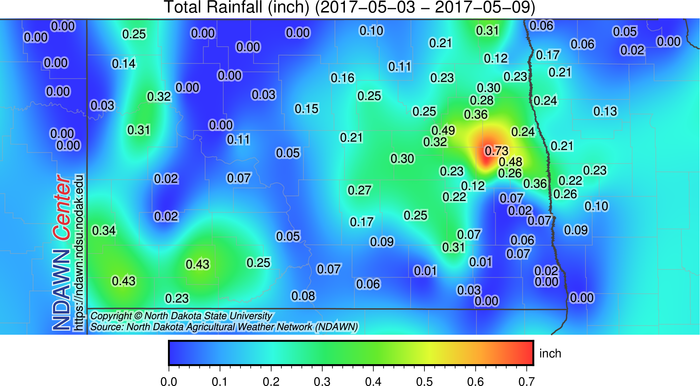 On Monday there were scattered quarter inch rains across the NDAWN mesonet with portions of Steele County recording over one-half inch amounts. 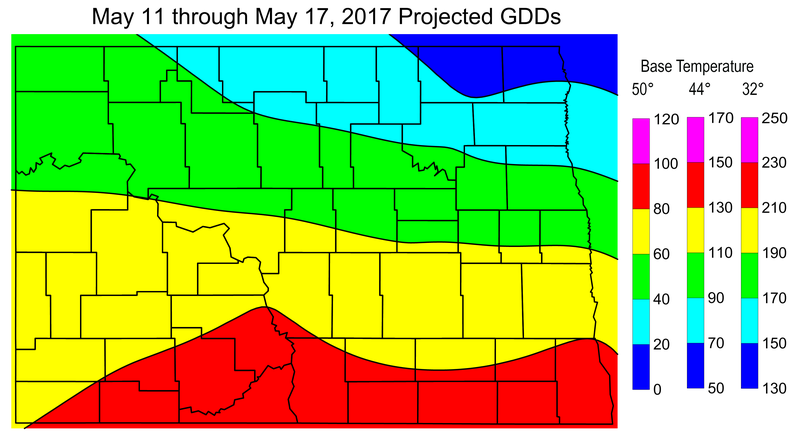 Another disturbance on Tuesday dropped around two-tenths of an inch in portions of southwestern North Dakota. This upcoming 7 day period will start off dry, but appears to be turning wet next week. Although much of the past week as indicated was above average for temperatures, there were areas of morning frost on Tuesday and Wednesday morning, plus, there was likely readings at or below 36° this morning (Thursday) as well. Even Friday and Saturday mornings may record minimums in the 30s in far northeastern North Dakota into northern Minnesota. As this chillier air moves east, another surge of warm air will be quickly moving back into the region. Southwestern North Dakota will have a high potential to record maximums around 80° or in the 80s on Friday and Saturday. Those warmer temperatures will be impacting the region through early next week, but that cooler air will remain nearby. What this means is there will likely be several days in the next week with large temperature contrasts from one part of North Dakota to another. Southeastern North Dakota will record the most persistent warmth during this period, with northeastern North Dakota recording the most persistently cool temperatures. Eventually the cold air may even move back into western North Dakota meaning the expected maximums in the 80s in the next few days could be replaced by minimums in the 30s by the middle of next week. Strong temperature contrasts are frequently a sign of a storm system or systems in the area and that looks to be the case next week. Mid-May through July 4 is the wettest period of the year across North Dakota with approximately 40% of the average growing season (May 1 to September 30) precipitation falling during this period. Therefore it is fairly normal for us to see an increase in precipitation this time of year and next week there looks to be three or four opportunities for rainfall. As we all know the rain never falls evenly in our climate, but 1 inch or more rain potential will exist next week and some 2 inch + totals would not surprise me. With those projected disturbances and the associated clouds, temperatures will be cooler in most locations in the next 7 day period with the highest temperature changes occurring in northern North Dakota over what was recorded this past week. The projected Growing Degree Days (GDDs) for the next 7 days, Base 50°, 44° and 32° are presented below.